Site last updated on the 3rd November 2012. 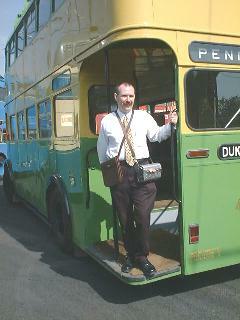 Me working at the June 2000 Trolleybus Rally at the Black Country Museum. The bus I'm standing on is Wolverhampton 433 a Sunbeam W with Roe bodywork. The chassis dates from 1946 and the vehicle was rebodied in 1959. Have a look round the site. There are pictures from the Black Country Museum and histories of the systems that operated in the West Midlands. There is also the inevitable list of all British trolleybus systems with opening and closing dates. Please note this is a personal web site coded in HTML using notepad. I do not have the time or resources to devote to it to make a professional job of it. The 2002 trolleybus rally was filmed by DAVideo (including an interview with me immediately after I'd passed my trolleybus test). Click on the photo for a link to their website - the video may be purchased online. I have always had a fascination with Trolleybuses and Trams. I was involved with a restoration project in 1969, but with exams and other things, that took a back seat until early in the year 2000. It was at a visit to the Black Country Museum I spotted the notice for the Transport Group and after a 30 year gap, re-joined. Unfortunately, it's 120 miles away from where I now live, so I can't attend as often as I would like, but there are quite a few other members in the same situation. I attended my first rally with the group in 2000, working as a conductor over the final 2 weekends. I also had my first trolleybus driving lessons, something that I had always wanted to do, ever since I was 14. I passed the museum's test during the 2002 rally on the 9th June 2002. After doing the "Ultimate Driving Experience", I'd also learned to drive the tram and passed the museum's test on the 31st March 2002. In September 2003, I passed my PCV test adding group "D" (buses & coaches) to my driving licence. So what is a trolleybus? The first ones appeared in public service in Leeds on the 20th June 1911. Bradford followed four days later, though they'd held their official first run on the same day as Leeds. The original idea, was a "trackless tram" to save the cost of laying track, but having the advantages of electric traction. After various methods of current collection, the twin trolleyboom and twin overhead wire system became the norm. In Wolverhampton, the first trolleybuses to actually look like a bus, rather than a tram, appeared. By 1930, the trolleybus was a clean swift and very modern looking vehicle. So what are the advantages? Simply, they are clean and silent. Unlike the diesel bus, there is no engine, only an electric motor. Uphill, they will leave even the most modern diesel bus standing, as they prove every weekend at the Black Country Museum (see the page showing the entire route in photographs). Imagine a pavement cafe in a street used by buses. The particulates from the diesel fumes, tiny and invisible, would cause as much damage to your lungs as passive smoking. Now imagine the same street used only by trolleybuses, no particulates, no health risk. Also, when waiting in a traffic queue or at a stop, they consume no power unlike the diesel bus with its engine still belching out fumes. Some people maintain that this is just moving the pollution elsewhere, but figures published by the campaign for trolleybuses for London indicate that using the dirtiest fuel to generate electricity would still mean an overall decrease in the total pollution level.